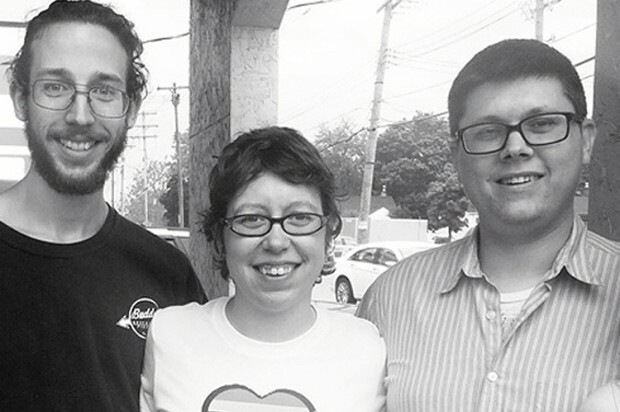 Polyamory in the News: "My Two Husbands"
Poly activist, writer and radical organizer Angi Becker Stevens lives with her two partners and 9-year-old daughter in Michigan. She has just published a fine, clear piece in Salon about her family and how it came to be. Everyone wants to know how my polyamorous family works. You'd be surprised how normal we really are. The author with her first husband, right, and boyfriend, left. My family is very ordinary to me. We eat dinner together. We gather in the living room and watch movies. Last weekend, we went on a camping trip and sat around the campfire making s’mores, the grown-ups enjoying a few beers while my 9-year-old daughter challenged us with endless rounds of “would you rather?” It all feels so wonderfully mundane that sometimes I have to remind myself that most people view us as strange at best, depraved at worst. I’m polyamorous, which means I believe you can love multiple partners at the same time. I’m in a relationship with my husband of nearly 17 years, and my boyfriend, with whom I celebrated my second anniversary in May. (In polyamorous lingo, our relationship is known as a “V”; I’m the “hinge” of the V and my two partners are the vertices.) People often say our lives sound complicated, but the truth is, we’re quite harmonious. We often joke that we’d make incredibly boring subjects for reality TV. Read on (August 4, 2013). Angi blogs at The Radical Poly Agenda. More from her tomorrow.